Last night I got the chance to see The Girl with All the Gifts 8 days before its 23rd September UK release and it was absolutely fantastic! Based on the 2014 novel by Mike Carey, The Girl with All the Gifts is a post-apocalyptic zombie horror film set in a dystopian near future where flesh-eating ‘hungries’ are taking over the city! And the survival of civilisation falls down to a select few including hybrid child Melanie played by Sennia Nanua who is a human flesh-eating hungry but retains the ability to think and feel for herself, which the other ‘hungries’ lack! Melanie and the rest of the hybrid children attend a school at an army base where they are subjected to tests and experiments by Dr. Caroline Caldwell (Glenn Close) who is looking for an antidote to end this mysterious fungal disease which is ravaging society. Caring school teacher Helen Justineau (Gemma Arterton) joins forces with Sargent Eddie Parks (Paddy Considine), Soldier Kieran Gallagher (Fisayo Akinade), Dr. Caroline Caldwell (Glenn Close) and Melanie (Sennia Nanua) on this journey of survival and to end the wide-spread of ‘hungries’ dominating the city! London-based actress Sennia Nanua who is just 12 years old was fantastic in her portrayal of Melanie, also scary at times when she went into hungry mode! Paddy Considine is consistently great whatever film he is in, and the same can be said for Close and Arterton who I have never seen in this type of role before. Also relatively new to the world of film acting, Fisayo Akinade was great as soldier Kieran Gallagher and comical at times. It was a little bittersweet to see Glenn Close looking so old in this film, as whenever I think Glenn Close I just see her as the infamous Cruella de Vil in the Disney classic 101 Dalmatians ! But I need to remember that was 20 years ago now! The Girl with All the Gifts was directed by Edinburgh born Colm McCarthy whose most notable directing roles have been in TV, Peaky Blinders, Ripper Street, Dream Team. So for a director with not many films begin him this was excellent! 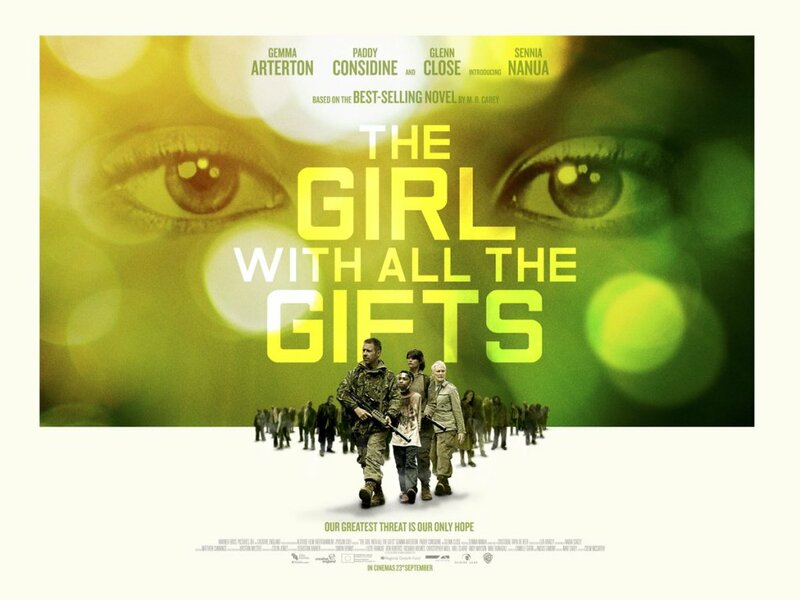 Catch The Girl with All the Gifts in UK cinemas from Friday 23rd September 2016.